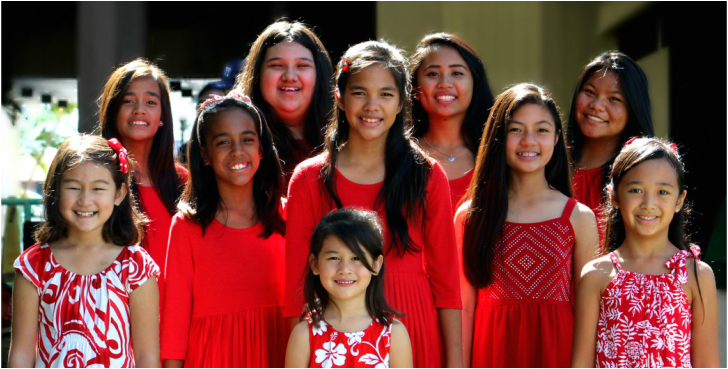 The KEIKI KANI CHOIR is an amateur performing group for children aged 4-12 and is comprised of public and private school children from all over Oahu. The children are trained in voice technique and stage production. Self-confidence and poise are developed through performance. The children of KEIKI KANI CHOIR learn and prepare a new set of music each Fall, Spring, and Summer singing of the joys of childhood and the season's holidays. Sample themes include: Christmas music, cartoons and commercials, teddy bears, popular songs, Mother's Day, etc. Each set of music may include solos, creative expression, rhythm instruments, and choreography. As a part of their education, the children perform their music at concerts all over Oahu. All public concerts are free and open to the public. The KEIKI KANI CHOIR has performed at major shopping centers, craft fairs, Honolulu Hale, Kapiolani Children's Hospital, various convalescent homes, on KHON TV'S For Kids Sake "Kid's Break", "Filipino Beat", Leon & Malia's "Keiki Calabash Christmas", and the "Perry & Price" radio show. The KEIKI KANI CHOIR children have been featured on the Easter Seals Telethon, the Hawaii Department of Education's video of "Children Like Me", and Leon & Malia's DVD, "Hawaii Kids Calabash."